Breakfast. That all important first meal of the day that gets you up and running (literally if you're always late for the train like I am) for the day. But don't lie, you skip it. Regularly. Even worst? Your at desk "breakfast" of choice is most likely a coffee (soy latte to be exact). It's a horrible habit that greatly diminishes your brain power, energy levels and is damaging to your overall physical health. But like so many things that aren't good for us, we do it because it's easy and convenient and really time management is not my best skill set at 7am in the morning. So what's a resolve that does not compromise speed and ease or demand more time in the early morning rush to work? Pre-packed breakfast is your answer! If you're working full time in an office environment you should be packing lunch at least 3-4 days a week as it is. If you work in the CBD (city) as I do, buying lunch everyday makes coming too work more about spending money than earning it! So, if you're packing lunch the night before, you might as well pack breakfast as well. Best part? Pre-made breakfast is a much less demanding task than lunch. > Breakfast on the go should be light and easy. Nothing rich and heavy simply because it'll make you too full and you'll be falling asleep at your desk rather than feeling energised and ready to take on the world! > Pick relatively hassle free, low maintenance foods so that you can eat it on the train or at your desk in the office. Don't be embarrassed, because I can assure you, everyone around you is either completely empathetic (they're on the same train, most likely going into work too!) or completely jealous, they're hungry bellies growling. > If you're self conscious and want to be discrete, pick foods that don't have a strong smell. Make a big batch Sunday night and keep it in the fridge. You can snack on it during the week whenever you like, but it's amazingly easy to pack in Tupperware and take on the go to work. 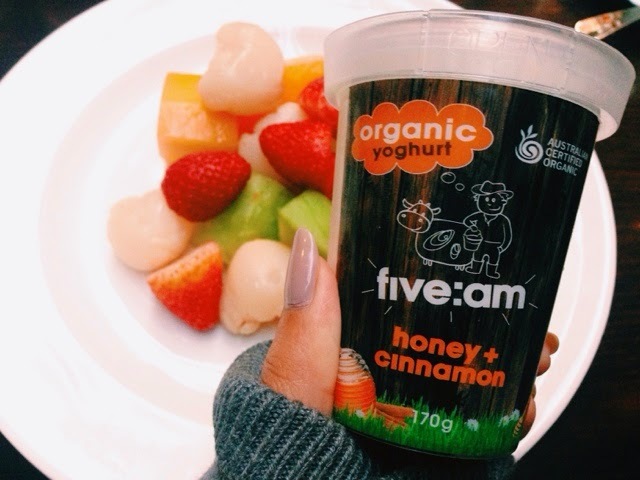 I am currently obsessed with Five:am's organic yogurt range. Honey & Cinnamon is my weakness. It's thick, it's creamy and completely addictive. I have a preference for dipping my pieces of slice up fruit in it but you can also stir in some granola for a filling breaky! So let's do our best to get on, and stay on, that breakfast bandwagon! Don't let a busy schedule compromise a balanced lifestyle.